Bright green, purple and orange means you’re getting a wide variety of nutrients in your diet. I know right now you are busy getting ready for Thanksgiving so the last thing you are thinking about is healthy dinners you can make – but I’m guessing, the week after Thanksgiving you may feel differently! Bookmark this page so when you can’t eat another tablespoon of gravy or cranberry sauce you have something lighter you can rely on. Also, today is the last day to register for the 1st round of the 12 Day Natural Detox starting December 1st, so click here if you want in! Another round starts December 13th and you can register for that one until December 6th. Anyway, back to stir fry! Do you find you avoid making stir fry ever because you feel like you need store a bought sauce to pull off anything tasty? I used to feel that way too but I finally started playing around with making my own because – well #1 it’s better for you and #2 stir fry is such an easy meal, I want to be able to make it anytime I want! If you keep a few simple ingredients on hand (like tamari, fish sauce, sriracha, sesame oil, broth, ginger, garlic, sherry and rice vinegar) you can make some really delicious food very simply! You may find you need to add a little brown sugar to make a sauce stand out if you’re used to sweet store bought sauce – and that’s ok – but I urge you to see what you can accomplish without sugar first. Cook and taste it. If it still needs sugar add a tiny sprinkle. I left sugar out of this recipe because I don’t really feel like it needs it, but I think I’m accustomed to a lower sugar diet more than others are. Adding sriracha or cooking sherry is another way you can brighten the flavors here. Experiment! 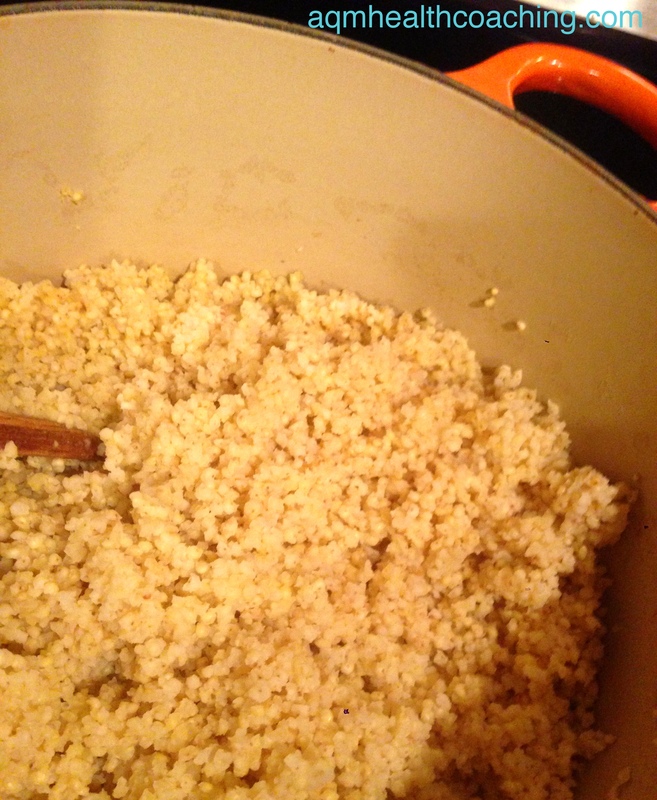 This gets most of it’s flavor from the generous amount of garlic, ginger and fresh turmeric in it. They add a spicy, earthy flavor and are so good for us! 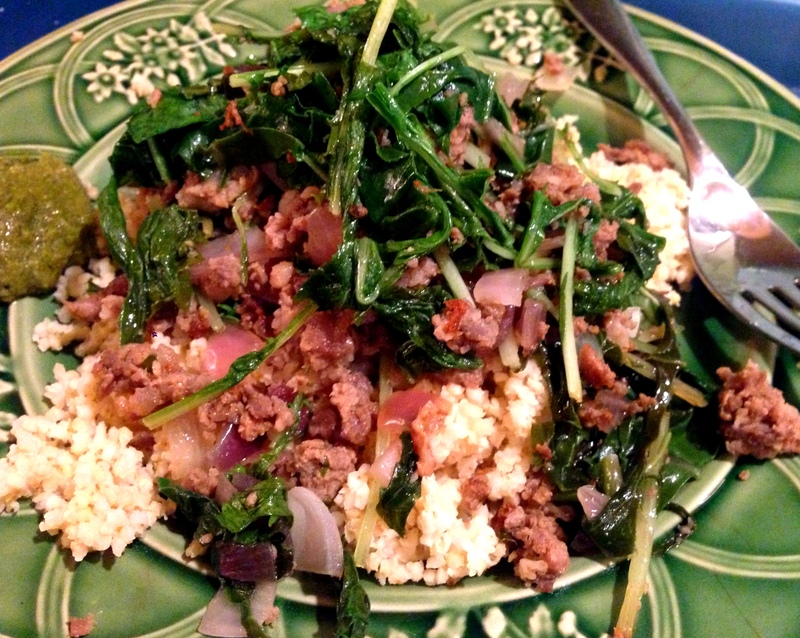 I used black japonica rice here because I love it! It has a sweet nutty flavor to it and it takes the same amount of time to cook as brown or wild rice. It’s nice to have some variety. One of the great benefits of trying different things is the range of nutrients you can get in your diet that way. Black japonica rice gets it rich color from a type of flavonoids called anthocyanins (red cabbage, cranberries and cherries do too!) which are known for providing many health benefits – they show promise for protection from atherosclerosis, inhibition of tumor cells and preventing inflammation. 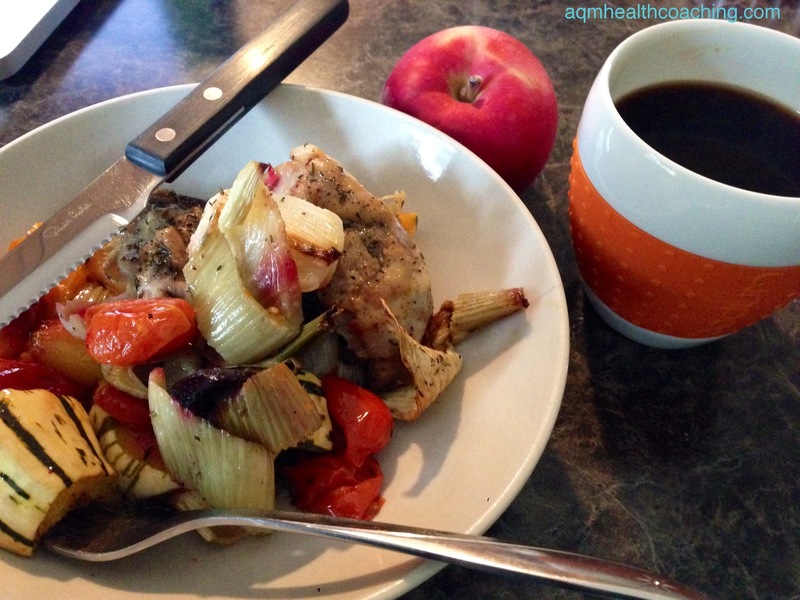 How do make sure you’re getting enough anthocyanins and other antioxidants in your diet? By making sure you eat a rainbow of color every day. This stir fry is a vibrant green (pak choi), purple (rice and cabbage) and orange (turmeric) – making it an awesome option for someone trying to increase the amount of color in their diet. chicken marinating and stir fried veggies. Marinate the chicken in the tamari, rice vinegar, sesame oil, five spice powder, turmeric, ginger and garlic while you prepare your vegetables. Heat a large wok or saute pan over medium high heat and add 1 tbsp coconut oil. 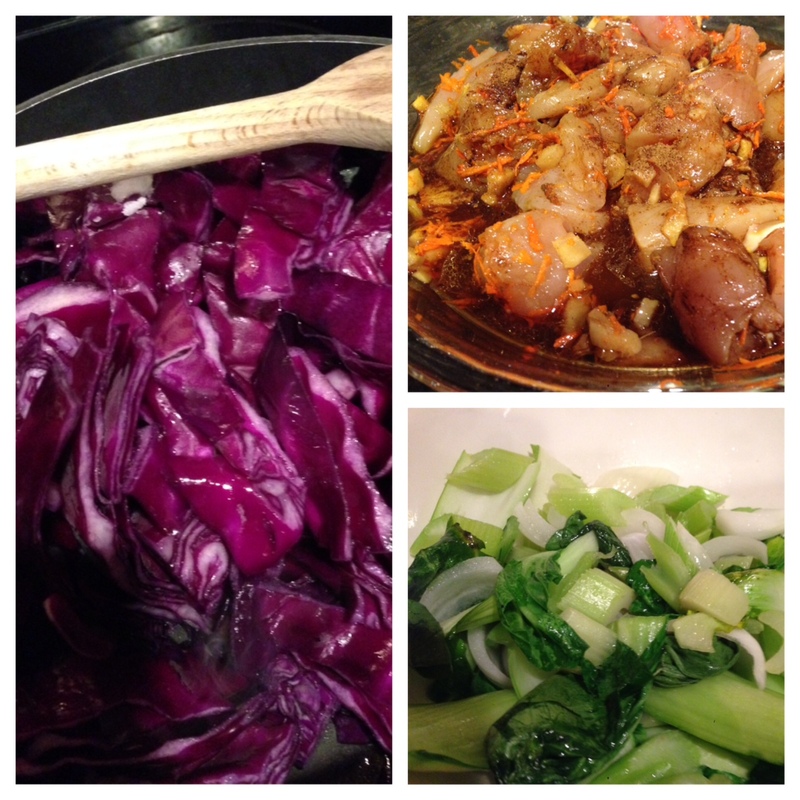 When the oil is melted and the pan is hot, saute the celery, onion, pak choi and red cabbage and saute for 3 – 4 minutes. You may need to do this in batches so that the vegetables don’t steam – you want them to cook quickly and for a short period of time. When the vegetables are slightly tender, remove them from the pan, place in a large bowl and cover with foil to keep warm. Put the pan back on the burner and add the marinating chicken mixture. Cook for 7 – 10 minutes or until the chicken is completely cooked through and the sauce thickens a little. Serve the black japonica rice topped with the vegetable mixture and then topped with the chicken mixture. This doesn’t make a lot of sauce but I think you’ll find when you use fresh vegetables and fresh aromatic ingredients to cook with that you won’t need as much! Having extra tamari on hand is good for those who need a little extra flavor on their plate. I also like to keep homemade sriracha on hand or buy a brand that doesn’t have a bunch of preservatives in it (whole foods has a few options) because I love the spicy stuff for meals like this! 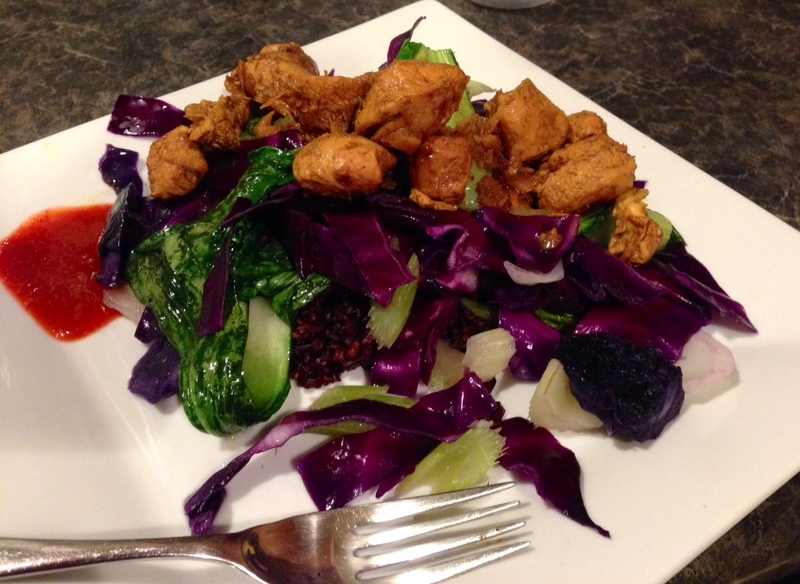 This entry was posted in Dairy Free, Gluten Free, Recipes and tagged Asian Food, chicken, ginger, pak choi, red cabbage, stir fry, turmeric on November 24, 2014 by Andrea Quigley Maynard. The holidays can be a stressful time, can’t they? 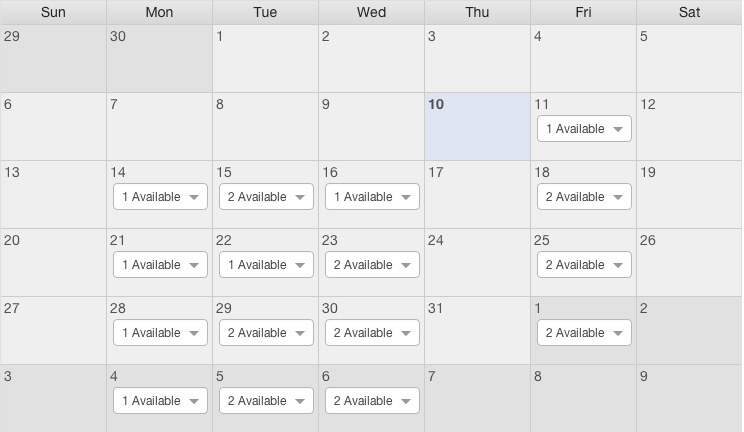 So much to do and there’s really not enough time to do it all. This year marks my 8th year hosting Thanksgiving. Those first couple of years were insane and hilarious as I tried to A) make food that didn’t taste horrible and B) get food on the table while it was still hot.I feel like I’ve got it down to a science to make it as least stressful as possible so for today’s email I’m sharing some of my favorite tips for a smooth experience and some healthy & delicious Thanksgiving recipes in case you are looking for a less indulgent meal! Don’t get me wrong, my Thanksgiving dinner is pretty indulgent! I assure you we’re not eating wheat grass and berries all day! But I do make everything (except for one thing) from scratch. John would kill me if I tried to take away his canned cranberry sauce. I’m not convinced there are any cranberries even in it but to him, it’s not Thanksgiving if he doesn’t have a gelatinous, can-shaped slice of red high fructose corn syrup on his plate. Pick your battles folks! Anyhow, here are the goodies I’ve promised! 1. Check out these vegan Thanksgiving Recipes by Kris Carr. Many vegan recipes at the holidays use meat substitutes made from wheat protein and processed soy which is terrible for us but Kris Carr focuses on whole foods – that is a vegan lifestyle I can support! Her recipes are delicious and aren’t too laborious. 2. 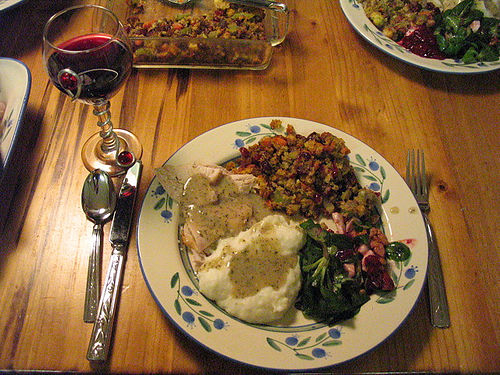 Check out these paleo Thanksgiving Recipes by Diane Sanfilippo. 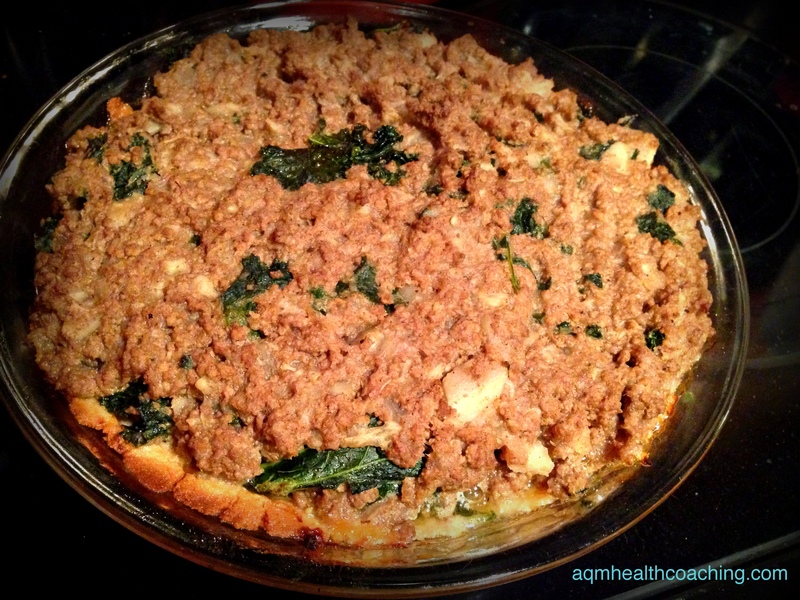 The green bean casserole we all grew up with pales in comparison to hers! Lots of delicious stuff here that you can use throughout the holiday season. 3. Raw Pumpkin Pie with Coconut Whipped Cream. So, if you’re not used to raw deserts, the texture of this one might put you off at first, but if you like adventure and are open, I think you will love this! It’s absolutely delicious and it’s certainly a treat worthy of Thanksgiving! 4. Raw Carrot Cake Bites. These are incredibly rich! Definitely cut them up into bite sized pieces or you will feel like a ton of bricks is in your belly (something we’d like to avoid). Same warning as above goes – be open to texture change. The first time I had these I was so impressed by how much the coconut oil & soaked cashews tasted like a cream cheese frosting. When I was blending it in my blender I remember thinking “there’s no way this is going to taste good!” but after some time in the freezer: Mind totally blown! 1. Don’t do your grocery shopping during peak times. The busiest times tend to be weekends, early morning and early evening (you know, when everyone is on their way home from work). Try shopping after dinner (the later the better) or mid-day during the week if possible and avoid the day before Thanksgiving at all costs! 2. Scan over the recipes you’re planning to make and chop & prep all veggies (except potatoes) a few days before. Onions, celery, carrots, and butternut squash all stay fresh for several days if you keep them tightly sealed. I recommend double or triple sealing chopped onions in multiple bags or containers if you’ve chopped several! They will flavor everything in the fridge if you don’t. 3. Get out all platters, serving utensils and serving dishes that you will need during the actual serving of the meal (including appetizers, drinks and dessert) and set them up on a counter or table the night before. The last thing you want to do in the middle of cooking is try to figure out where you last saw your pie server 364 days ago. It will make a huge difference in how smoothly things go during the event with a little planning. I even set them up in the order I will be using them and place the utensil needed for that item right on top. 4. Think about planning out your timing . If you’ve never cooked a big meal for a holiday before and are worried about having everything done on time, take some time to “plan” a strategy. I actually make a spreadsheet and make a column that lists everything I’m making, one column for oven temps, another for approximate cooking times and then I create another column with the time that I need to put something in the oven or start something on the stovetop. To figure this out, I work backwards from the time I want to serve dinner and subtract the cooking times (and resting time for the turkey) until I know what time each item needs to get started on. I then sort the column that lists each dish by the order it will be started – turkey goes in first, gravy is done last etc. I even include a row for steps I might forget about when I’m mingling with guests or cooking, such as reminders to take appetizers out of the fridge at a certain time so that they’re room temperature, or to open a bottle of wine to breathe. I know it all sounds a little Type A to do it that way but it takes so much work out of the day if you sketch it out! I even do planning like this with cleaning for holidays, gifts and anything else that is easy to forget when really busy. Find a system that resonates with you and you’ll never go back to winging it ever again! 5. Enjoy the food, the people and the day. No matter what your way of eating and no matter what kind of food is on your table on Thanksgiving – enjoy it! Take a little bit of all the foods you enjoy and savor each bite. Problems arise when we view certain foods as “off-limits” or “bad”. Barring any health condition that actually requires you not eat certain foods for your safety (such as in the case of nut allergies or celiac disease), there’s little harm to your waistline with just one meal. Relax and enjoy every bite! Then try to go back to normal eating the next day. It’s ok if you treat yourself to one indulgence over the few days following (with all those leftovers, how could you not?) but try not to see it as a free for all. You deserve to enjoy it, but you don’t deserve to feel crappy about yourself, and you will if you see it as a feast or famine situation. Christmas is around the corner – there are plenty more treats coming. And if the holiday season tends to be a food free for all for you and you’re tired of gaining weight each year, consider joining my 12 Day Natural Detox program. Groups start December 1st and 13th. Either one you choose will help you get your cravings under control and still enjoy Christmas day. It’s all real food that you prepare yourself. No weird packaged processed junk to buy! You may feel so good afterwards that you change your eating habits permanently like I did. If I don’t talk to you before then, have a lovely, warm and relaxing Thanksgiving with your family and friends! I have a lot to be grateful for this year – including all of you! This was originally posted as an email. To be included on this list, sign up in the green box below! 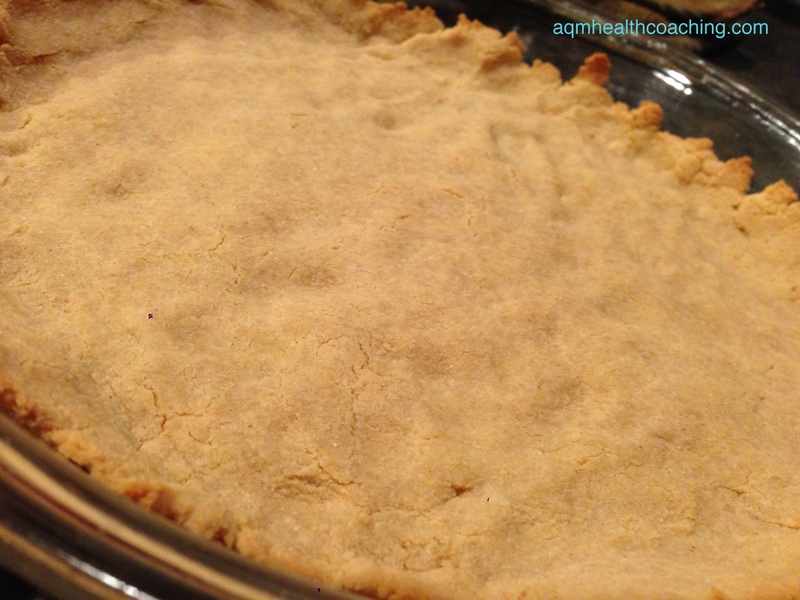 This entry was posted in Healthy Tips, Real Life, Recipes and tagged Healthy Thanksgiving Recipes, Planning, Stress Free Thanksgiving, Thanksgiving on November 18, 2014 by Andrea Quigley Maynard. Tastes way better than it looks. Someday I’ll remember to take a pic before I’ve let it cook for too long! This meal was the result of a total “there’s nothing to eat in the house, what can we eat for dinner?” but it turned out to be a pleasant surprise (which let’s be honest, could have been a disaster). It was filling and satisfying without being too heavy and the ginger & turmeric broth was great for a chilly night. I was running pretty low on veggies (rare in this house), had a plantain that was going to be too ripe if I didn’t hurry up and use it and had some cod in the freezer. I had coconut milk but no curry paste, no scallions, no cilantro etc. I was half ready to pick up the phone to ask John to grab some takeout on his way home but I tasted it and it was actually pretty good. I am not a fan of fish in soups . . .so this would not be my first choice of ingredients together. . . but I’m very grateful that random pantry & refrigerator cooking didn’t turn out disgusting! The plantain does a great job of thickening the broth and adds a little sweetness that rounds out the flavors (especially since I didn’t have some of my usual curry staples on hand). And it blends in pretty well – if someone didn’t tell you there was plantain in it, you’d probably have no idea. If you don’t have access to plantains, you can try adding a grated potato or sweet potato instead. And I hope it goes without saying, use the full fat coconut milk (not the lite stuff). There is not much other fat in this meal (cod, veggies, spices) and the saturated fat in coconut milk and coconut oil are good ones to have in your diet. Remember, keeping your blood sugar stable and cravings under control is really about having a balance of fat, protein and fiber in every meal and if you try to go very low fat you throw that balance off and you may find yourself digging in the cabinet for sweet treats not too long after dinner. Fat = satisfaction. Heat the coconut oil in a large saute pan over medium heat. When hot, saute the onion, shallots and carrots for 3 – 4 minutes, then add the curry powder, cardamom and smoked paprika and stir until fragrant, about 30 seconds. Add the coconut milk, broth, ginger, turmeric and plantain to the pan and bring to a boil. 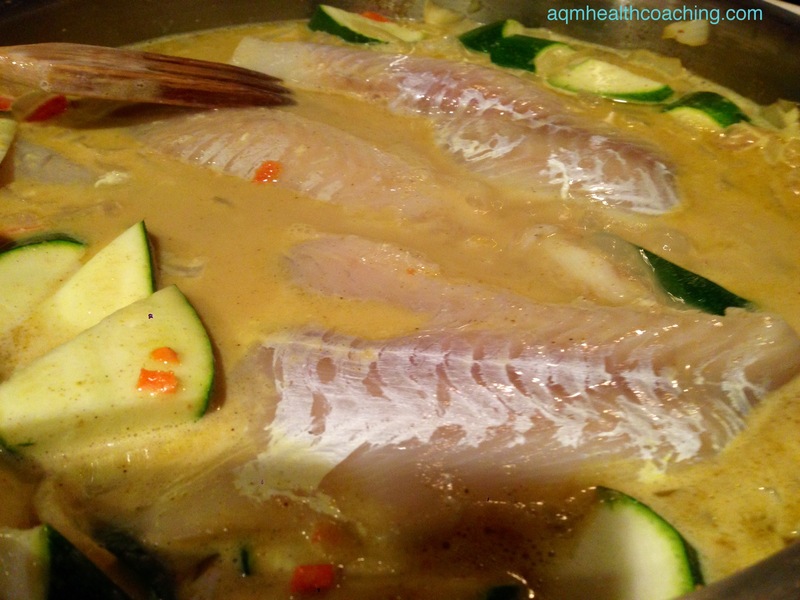 Add the cod and zucchini, submerge, cover and bring back to a boil and reduce to a low simmer. Cook for another 7-9 minutes or until the fish flakes easily. Stir in the parsley or cilantro, season with salt and pepper and a squeeze of fresh lime juice and serve. 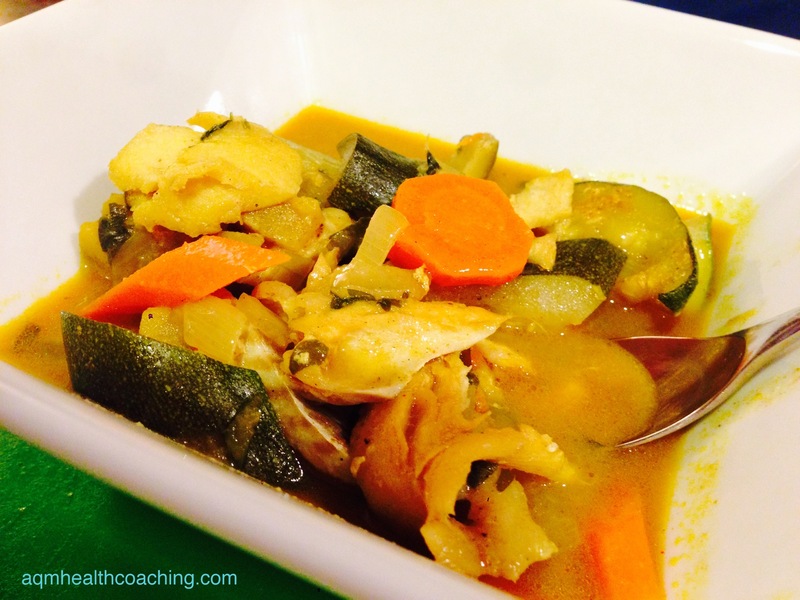 This entry was posted in Dairy Free, Gluten Free, Recipes, Tree nut and Peanut free and tagged coconut curry, plantains, turmeric, Wild Cod, zucchini on November 16, 2014 by Andrea Quigley Maynard. I’m turning in to a squash lady. I’ve had more squash this fall than ever before, probably because our CSA at Middle Branch Farm gave us many varieties this year (blue hubbard, red kuri, butternut, acorn, buttercup etc). Oh and I’ve fallen in love with kabocha squash – I could eat it daily. 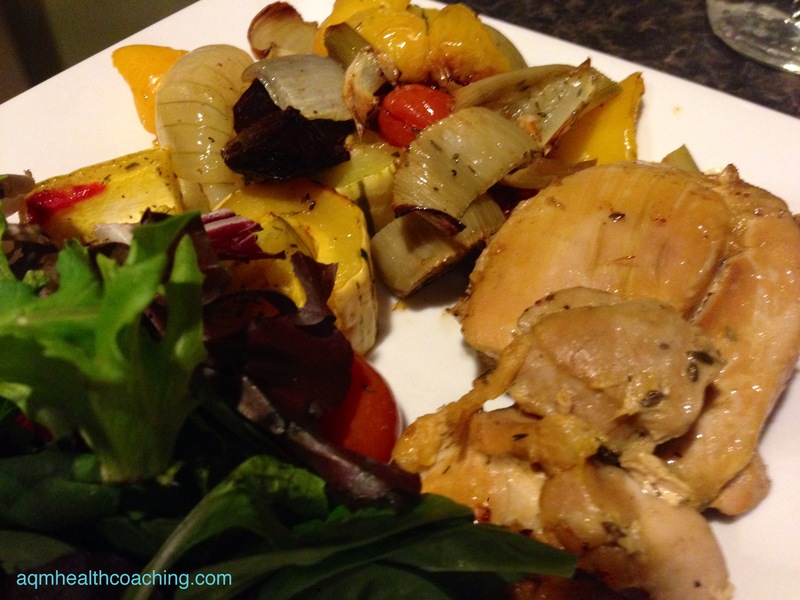 So here’s yet another recipe with squash in it! Tis the season and this girl likes to eat in season when she can. Anyhow, I feel like this isn’t really a recipe since it’s a typical type of meal for us – random vegetables and protein roasted together in one pan. Boom. Dinner is done. But this one was pretty tasty (thanks to flavorful fennel, garlic and the richness of chicken thighs) so I wanted to share it, again as an example of how eating whole foods and avoiding processed food doesn’t have to be incredibly difficult. To show you that you CAN do this. This was so delicious that I ate leftovers of it for breakfast the next morning. Yeah, eating whole foods regularly makes you opt for non-traditional breakfasty foods on a pretty regular basis. I don’t question it, I just eat! I actually had never had delicata squash before but I saw organic ones at the store this week and decided to buy them since you can eat the skin (yay for not cutting my fingers off!) and they’re easier to cut than other squashes. The flavor is similar to butternut and the skin texture is similar to a thick summer squash. You can use chicken breasts or tenders in this instead of chicken thighs but they will definitely be drier than chicken thighs. Thighs have more fat in them (but it’s not necessarily a bad thing – they’re higher in omega 3s than lean chicken) and it keeps them tender through even long cooking time. And as with many of the recipes you will find on this blog – don’t feel like you have to stick to the ingredient list exactly! Sub one squash for another, if you don’t have fennel, try something flavorful or crunchy like celeriac or jicama (or whatever else you like). Veggies are our friends and if you are willing to experiment you may find a new love! Put it on a big sheet pan. It’s ok if they’re a little crowded! Preheat oven to 375 degrees. Prep all your vegetables (tip: save the fennel fronds and freeze to add to homemade broth later!) and lay them on a cookie sheet with the chicken thighs. No need to trim the fat if organic (unless they are overly fatty or not organic). The fat will add a lot of flavor to this dish. Pour the melted coconut oil over the vegetables and chicken and quickly toss with your hands to coat. Sprinkle with thyme, salt and pepper and roast in the oven for 45 – 50 minutes, or until chicken is cooked through and vegetables are tender. It’s like a bowl of warm, earthy fall goodness! 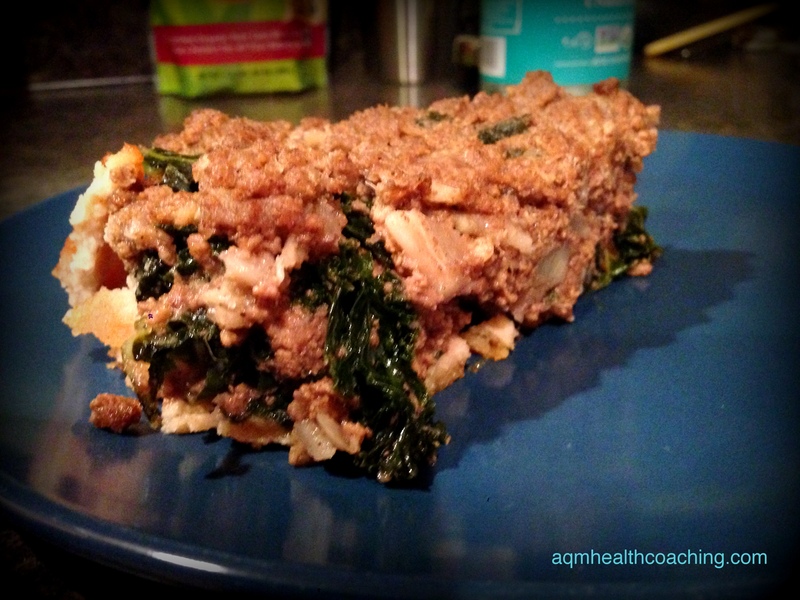 Serve with a side of cooked or raw greens! 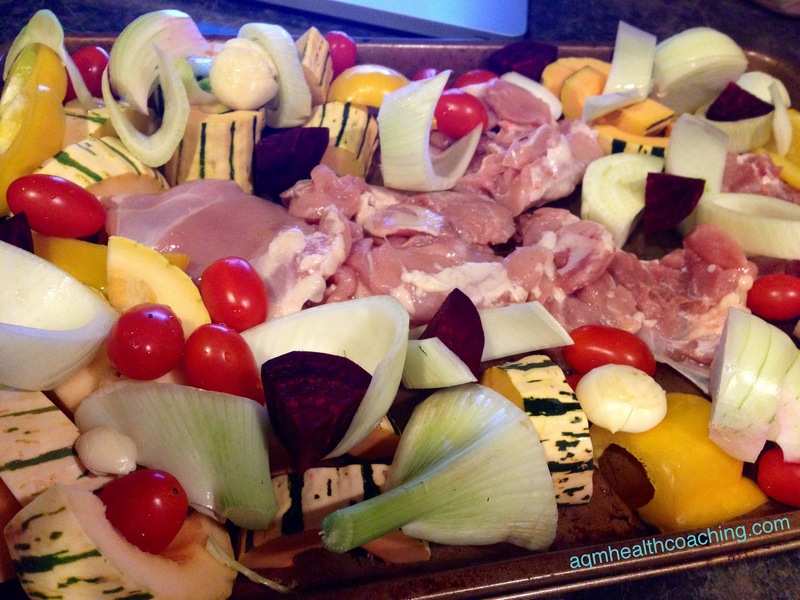 This entry was posted in Dairy Free, Gluten Free, Recipes, Tree nut and Peanut free and tagged chicken thighs, coconut oil, delicata squash, fennel, roasted vegetables on November 13, 2014 by Andrea Quigley Maynard. So good, you’ll want to make more than one at a time! I know pumpkin season is winding down so I’m a little late with this (but hey, girl has been busy). Sometimes you want something that tastes like it’s bad for you, but isn’t. This smoothie will hit that spot. The best part is that it’s dairy free, gluten free and there’s no added sugar or chemicals in it. For once, I resisted the urge to put 10 cups of vegetables in my blender to make a nutritious snack. It was difficult. I found my hand reaching for the refrigerator door to grab some greens! But I resisted! Sometimes I forget that there are foods that are good for you that aren’t vegetables. Haha. This smoothie is absolutely delicious! And you can enjoy it guilt free. No pumpkin flavored bullcrap chemicals – we’re using real pumpkin here so you can get a huge dose of vitamin A and fiber. Real spices (did you know that cloves have one of the highest polyphenol content of any food or spice? Polyphenols are a type of antioxidant) and fresh ginger (great for belly discomfort and a potent anti-inflammatory). The only sweetener in it is banana. It’s a decent source of potassium and iron too! I like to drink it warm but it’s delicious cold too! Put all ingredients in a blender and blend until well combined. You can drink this smoothie cold or hot. I like to let the blender run for another minute or two until the smoothie is warm. There’s only a few grams of protein in this one, so feel free to add a few more tbsp of pumpkin seeds to give this more staying power (make it a meal). You also can omit the seeds entirely if you don’t like them or don’t have any on hand – it will still taste fine without them. Serve immediately or someone else will drink it on you. 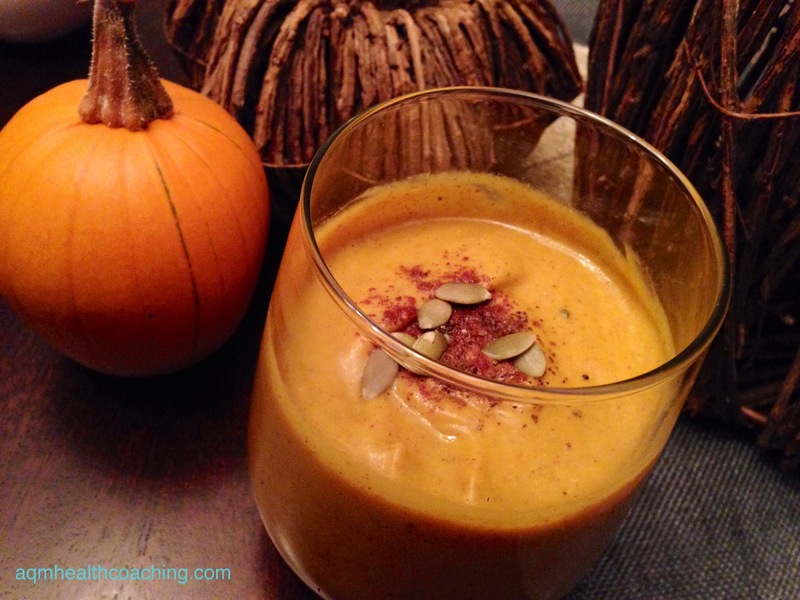 This entry was posted in Dairy Free, Gluten Free, Recipes and tagged cinnamon and cloves, coconut milk, pumpkin pie smoothie on November 10, 2014 by Andrea Quigley Maynard.